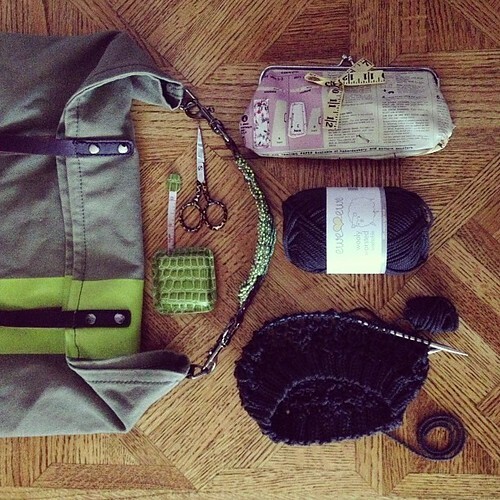 What's in my knitting bag this week? Um... Crochet! Oopsie. Actually, the Wearever Wrap is a fun and easy half-granny square shawl that is really fun to crochet. If there's such a thing as crochet-for-knitters this wrap may be it. The Wearever Wrap is all double crochet so it works up quickly and the stripes of Wooly Worsted yarn colors keep it moving along. It's definitely one of my favorites! Click here to see the Wearever Wrap. Look what I found at my knitting group tonight, an Adoracole baby cardigan on the needles! My friend Kathy picked three colors of Wooly Worsted yarn and then did her own striping pattern with pink, saffron and pistachio. I love love this combo! Happy knitting!